This Hubble Space Telescope image shows the peculiar galaxy NGC 3256. The galaxy is about 100 million light-years from Earth and is the result of a past galactic merger, which created its distorted appearance. As such, NGC 3256 provides an ideal target to investigate starbursts that have been triggered by galaxy mergers. A misshapen galaxy shines in a newly released photo captured by the Hubble Space Telescope. The image shows NGC 3256, a galaxy about the same size as our own Milky Way that lies about 100 million light-years from Earth, in the constellation Vela (The Sails). "The brightness blooming in the center of NGC 3256 gives away its status as a powerful starburst galaxy, host to vast amounts of infant stars born into groups and clusters," they added. 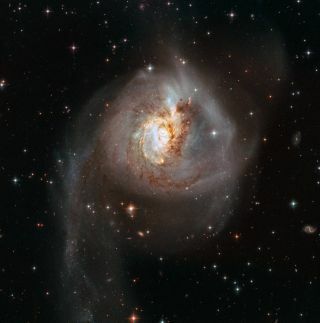 The galaxies that collided to form NGC 3256 probably harbored similar amounts of mass, because the gravitational tug-of-war between the two seems to be a draw, ESA officials said. And the object's current shape won't last; in a few hundred million years, the cores of the two original galaxies will merge, and NGC 3256 will become a large elliptical galaxy. Hubble has been helping astronomers better understand the universe, and thrilling laypeople with its gorgeous cosmic postcards, for more than a quarter century. This ground-based image shows the spiral galaxy NGC 3256 and its surroundings. The iconic telescope launched aboard the space shuttle Discovery in April 1990, but a slight defect in its primary mirror caused its initial images to be a bit blurry. Spacewalking astronauts fixed the problem in December 1993; further on-orbit repair, maintenance and upgrade work was performed on four additional servicing missions between 1997 and 2009. Hubble captured the newly released photo using its Wide Field Camera 3 and Advanced Camera for Surveys instruments, ESA officials said.